Bill Gates traveled to Nigeria to publicly give its leaders some tough talk. It was a highly unusual move but the tech billionaire believes the country is facing a critical moment. "While it may be easier to be polite, it's more important to face facts so that you can make progress," the philanthropist told a room of Nigeria's government elite that included the president. In an exclusive television interview with CNN, Gates said he wanted to speak out to implore Nigerian politicians to focus on human capital and its large youth population. "The current quality and quantity of investment in this young generation in health and education just isn't good enough. So I was very direct." The tech billionaire and founder of the Bill and Melinda Gates foundation feels that he has earned the right to speak. Gates says he has traveled to Nigeria for more than a decade and the foundation is spending $1.6 billion on programs here -- most of it his own money. Their primary focus is health and their work has been incredibly successful in mitigating the threat of polio, particularly in the crisis hit northeast of the country. Gates feels, along with many others, that it is time for Nigeria's government to do better. The continent's largest economy is moving out of a recession caused by a tanking oil price and moving towards a closely watched presidential election in 2019. In many ways, the country is transforming, with gleaming hotel towers on Lagos Island competing for real estate and the wealthy fighting in the notorious traffic in ubiquitous black SUVs. But dig a little bit deeper and the statistics are alarming. As Gates points out, Nigeria is still one of the most dangerous places to give birth and the country's very young face chronic malnutrition. University of Washington modeling, commissioned by Gates, estimates that if investment isn't increased in health and education, then the per-capita GDP, rising steadily for decades, will flatline. Gates says he wanted to spark action and debate and he certainly has. Predictably, some see the tough talk as a rebuke of Muhammadu Buhari, Nigeria's president, who has been struggling to get the economy on its feet and stamp out the persistent threat of Islamist group Boko Haram in the northeast. On the street, many just want support from their government -- whoever is in charge -- because right now there often isn't much. "These people are just trying to survive, they aren't being helped," said banker Moses Uchendu, while grabbing lunch at the popular Obalende market in Lagos. It's a bustling market where vendors sell delicacies such as efo riro, a spicy Yoruba stew. Power outages are frequent and the only contact with officials is when they visit for bribes, say residents and traders. Nigeria is routinely rated as one of the most corrupt nations on the globe. Although the country recently moved up 14 places on the World Bank's ease of doing business ranking, most of its businesses remain in the informal sector where there is little help and loans are hard to come by. Few businesses pay their taxes and all these factors have hindered Nigeria from meeting its true potential, says Gates. Uchendu hopes Nigerians are listening. "I told my friends... that Bill Gates is saying the truth. It is better we are told the truth about Nigeria's economy. It is better we say the truth." But Gate's message isn't a new one. Activists say they have been making frequent calls to invest in people, and end rampant corruption, all which have been ignored. "These are not new topics. These are the issues that we have been discussing with the government. We have been engaging with them for so many years now," says Timothy Adewale, a human rights lawyer with one of Nigeria's largest NGOs. "Nobody will listen. You know, actually, if they are sincere about the best interest of the people, they should listen. It has always been said that the greatest test of your commitment is your actions." 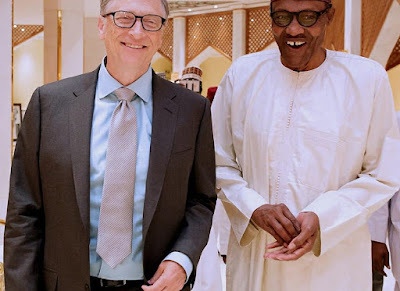 But Gates believes, together with Aliko Dangote, Africa's richest man and a close partner of the Gates Foundation, that if the Nigerian government does a few things differently, then the country is poised for lift off. "I really think that of all the countries I have seen, it really hangs in the balance. If they can get health and education right, they can be an engine of growth, not just for themselves but for all of Africa," said Gates.